Over the past few weeks, as I have read through our devotional, Imagine a Church on Mission, your love for Christ, your love for His Word, and your love for His Church have all been on display. As a pastor, what’s most heartening for me, is your love for Christ’s world that so clearly shines through. Your desire to connect people to the presence and power of Jesus Christ defines St. Andrew’s. In the face of cultural challenges the temptation for Christians and for churches is to turn away from the public square, to abandon our public witness, and to retreat behind the four walls of our homes and churches. But that is not what we have done. We have continued to hold forth the Word of Life – continued in our efforts to reach the least, the last, and the lost with the Good News. I believe that we are at a kairos moment – a moment of divinely given opportunity – and are to continue to push forward in expanding the Kingdom of God in the Charleston area and beyond. If you’ve been around St. Andrew’s for any length of time, you might know that nearly every storage space in our buildings has been converted into an office or meeting space. Our bookstore originally was storage space for the Ministry Center. In one case, we even put a desk in a closet and now use it for both storage and an office. We don’t add staff because we think we need more people. We don’t add staff until we’ve gone beyond the need for more staff. 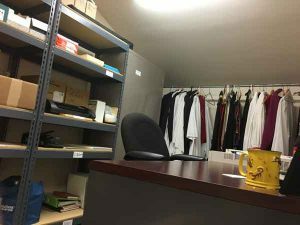 We’re at the point that we now have clergy and other pastoral staff sharing office spaces. Some of our church plant staff work from home because we don’t have room for them. That is a direct result – the fruit – of the growth of St. Andrew’s across our campuses, Mt. Pleasant, City Church and Park Circle. We’re not building new space in order to have more room for worship. We’re building new space in order to continue to resource church planters, congregations, and you in order to reach our community. Where do we stand in the Imagine 2040 campaign? As you know we kicked off the public phase of our campaign just before Easter. In preparation for the public phase we had any number of conversations with folks in leadership across the parish; the Vestry, previous Senior Wardens, LifeGroup leaders and LifeGroups, staff, etc. seeking their ideas along with their verbal and financial support. Jacqui and I also made a pledge as well. And I am thrilled to share with you that just over $5,000,000 has been pledged toward the completion of the campaign! Our hope is to raise $6-8 million allowing us to meet the most pressing ministry space needs. Next week you will receive a letter with a pledge card included. The Imagine 2040 campaign will end at the end of May. I ask that you prayerfully consider your/your family’s participation in the expansion of mission, discipleship and ministry opportunities as we look ahead to the next 25 years. Please keep in mind that we are not asking for equal gifts but that you give sacrificially. Lastly, I urge you to continue to pray along with the rest of the parish, using Imagine a Church on Mission as your guide. You can find printed copies at church on Sundays. Additionally, you can read it daily on all of our campus Facebook pages, or download it from Imagine2040.com.